The Israeli daily Ma’ariv reports (Hebrew) that Secretary of State John Kerry and his staff believe President Barack Obama “sabotaged” their peace efforts in an interview he gave this week to Bloomberg News. Obama attacked the Israelis and their elected officials for allegedly undermining peace with the Palestinians by building settlements in the Bloomberg interview. He also accused Israel of committing national suicide by holding up the creation of a Palestinian state, which Obama says is necessary for Israel’s survival. The Ma’ariv report says “sources close to Kerry” are quietly complaining that “Obama has been sabotaging Kerry’s efforts to achieve an agreement on the ‘framework deal’” that would serve as the basis for final-status talks. 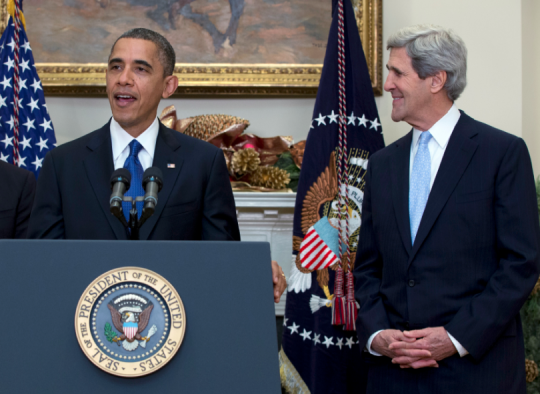 Kerry has made the Israeli-Palestinian peace process the primary focus of his work as secretary of state.